Posted on Fri, Jan 13, 2012 : 7:41 a.m. There were crashes “all over” a dispatcher said at 11:20 a.m. Police and firefighters have been busy all morning dealing with crashes on freeways and secondary roads. Most appeared to involve property damage only, but detailed information was not available. The National Weather Service advised drivers to use caution as light snow continues in the area and untreated roads are expected to remain slippery. About an inch of snow fell overnight, said Debra Elliott, the observation program leader for the weather service's office in White Lake Township. She said any additional accumulations would be minimal. Other parts of Michigan were dealing with much heavier snowfall. Up to 7 inches had been reported in some areas near Grand Rapids and parts of western Michigan are under a winter storm warning. A large section of the state is under a winter weather advisory. The forecast for the rest of the day calls for scattered snow showers in the afternoon and highs from 24 to 28. Tonight, there’s a 40 percent chance of scattered snow showers. The temperature will drop to a low around 16. For updated forecasts and conditions anytime, check AnnArbor.com's weather page. 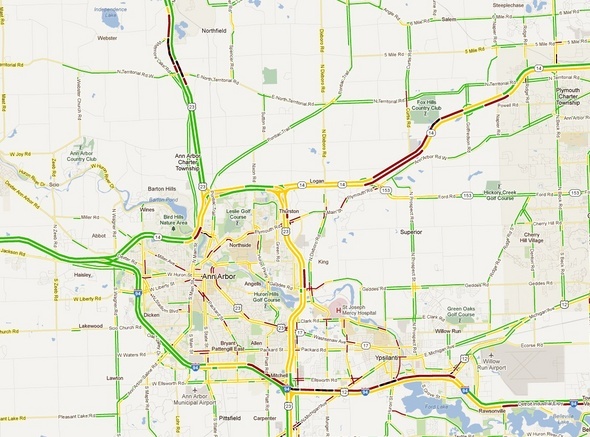 This Google traffic map of the Ann Arbor area from about 9 a.m. Friday shows traffic slowdowns in yellow red and black. Sat, Jan 14, 2012 : 2:46 p.m. Sat, Jan 14, 2012 : 12:16 p.m.
A lot of drivers only know gas and brake they have never heard of coasting and leaving the proper distance to keep from applying or slamming on the brakes. Sat, Jan 14, 2012 : 2:44 a.m. Sat, Jan 14, 2012 : 1:02 p.m.
Sure, more mandates for the party of fewer mandates, less regulation, less government control .... Unless its government control of bedroom activities or taking from the poor and middle class to give to the rich, pledges for our children, reporting the weight of our kids, etc, etc. Sat, Jan 14, 2012 : 1:02 a.m. Pretty hard to stop on a skating rink! SALT the dang roads! We may disagree on these boards, but I hope your all safe tonight if u have to go out. Fri, Jan 13, 2012 : 10:10 p.m.
Is this for the snow that so many ridiculed the forecasters about on these boards and predicted would never occur ? Those that said that snow storms of that size must mean that it was a slow news day ? Or that predicting snow storms isn't news? Thought so. Guess the drivers affected wouldn't think so. Fri, Jan 13, 2012 : 7:08 p.m.
On I-94 eastbound this AM on the Washtenaw side road slippery cars off the road, ambulance, etc. Once I crossed the Wayne County line, the roads plowed, salted ready to roll. Fri, Jan 13, 2012 : 8:08 p.m. Okay, do you realize as an Interstate, I-94 is maintained by STATE plows from MDOT? Not county. Wayne versus Washtenaw means nothing. Fri, Jan 13, 2012 : 7:02 p.m. So hey folks, just SLOW down! Is not a brainer. Fri, Jan 13, 2012 : 6:57 p.m. Yes, we live in Michigan, you should be prepared to drive through any conditions, no matter if there is salt on the road or not. Quit tailgating, rushing to work, and spazzing out if someone in front of you is actually going the speed limit. Take a chill pill, use your brain, your SUV is not better than the other cars on the road. Go pull some brodies in a snow filled vacant parking lot and learn how to control your car when it slides. Fri, Jan 13, 2012 : 8:26 p.m.
Agree, but we called them &quot;Rockfords&quot; from the old James Garner show, lol. Fri, Jan 13, 2012 : 8:17 p.m.
Good post! That is a major key to winter driving - learning how your car responds once it has lost full traction. I urge new drivers to try the hand brake, do some donuts, etc. Learn how it slides, and how to bring it back under control. Fri, Jan 13, 2012 : 6:22 p.m. I'm amazed at the mediocrity that A2 residents put up with - I have never, ever seen such sub-par snow removal/salt/sand usage in my life. Come to our SW A2 neighborhood - if you don't like figure skating, you can do figure eights in your car. Come on Townies - you say how fantastic this City is (and in many ways I agree) - but this borders on the ridiculous. And by the way - I challenge you explore the snow removal sites on A2gov's website - no methods to contact them at all. Insane! Fri, Jan 13, 2012 : 6:14 p.m. Okay, the whole conspiracy about the city and county not doing their jobs as it pertains to plowing is just silly. Every time it snows some people blame the local government. I live in MN and used to live in MI, it's the same deal. People complain in Minnesota, people complain in Michigan. &quot;The city doesn't care, doesn't spend our dollars on salt&quot; blah blah blah. It's the same argument, different places spouted out by those who always need someone else to blame for their &quot;problems&quot;. Snow is going to make roads more hazardous, period. Especially if it is still falling! If you are going to drive, slow down, know it will take longer to get places and that the roads are not going to be dry right away. Fri, Jan 13, 2012 : 6:13 p.m.
Really? Snowfall sends drivers crashing? If snowfall is so violent, then we as a civilized world should embrace global warming. Fri, Jan 13, 2012 : 5:56 p.m. If we could only know I suspect some of those blaming the road crews have been involved in numerous accidents themselves. Having said that there are spots and conditions that regardless of your driving skill will cause problems. ie: The hill on Miller at Seventh. You must give room in front of you especially on hills. Sat, Jan 14, 2012 : 11:42 p.m. Sat, Jan 14, 2012 : 3:56 a.m.
Fri, Jan 13, 2012 : 5:25 p.m. Apparently some of the drivers who claim they cannot possibly slow down or stop for pedestrians feel similarly about slippery roads... And this is the result. I look forward to their comments that blame the snow and ice for their driving. Fri, Jan 13, 2012 : 5:35 p.m.
You are SOOO right, Ron. Geez, the people bellyaching and not taking responsibility for their own lack of driving skill. Glad they didn't have to handle rear-wheel drive Impalas in 5&quot; of snow like we did back in the day! Fri, Jan 13, 2012 : 5:15 p.m. If the accidents were completely the fault of the Road Commission for not salting such dangerous and horrific roads, shouldn't every car be in a ditch or up a curb? Take some responsibility. Fri, Jan 13, 2012 : 4:49 p.m.
Well, these posts display excessive amounts of pure stupidity. Salt does not work below certain temperatures, somewhere in the low twenties. The major cause of these accidents is very poor drivers driving to fast for existing. My sympathy for those hit by these bozos. As for those who cause the accidents with excessive speed and weaving in and out of multiple lanes of traffic, serves you right. Sat, Jan 14, 2012 : 3:48 a.m.
@Johnson48racing....some of these people amaze me...they blame everyone BUT themselves for their lack of common sense they also are the people that get mad at the tow truck for taking so long to get to them because they are stuck in a ditch. Sat, Jan 14, 2012 : 2:28 a.m.
People think that if the salt trucks don't have every stretch of road salted and bone dry by the time they get in their toyota prius stop by Starbucks and get on their merry way that all the truck drivers are home sleeping in. They should let some of these yahoo who know it all ride around with the truck drivers and see what they have to deal with mainly the people who are too busy yapping on the phone and sipping their coffee all while still driving 80a and weaving in and out of traffic. Fri, Jan 13, 2012 : 6:51 p.m.
jcj, You are right. I stand corrected. Should have said the same drivers keep CAUSING the accidents! Fri, Jan 13, 2012 : 5:12 p.m.
Amen! Same drivers keep having the accidents! Fri, Jan 13, 2012 : 5:02 p.m.
Fri, Jan 13, 2012 : 4:39 p.m. The simply truth is that the city of A2 and the county don't take snow removal or winter road treatment seriously. They lurch from season to season, blaming the drivers and not taking responsibility for the lack of plows and personnel and the lack of salting. There is always an excuse: drivers are going too slow, drivers are going too fast, it's too cold for the salt to work, it's too warm and it will melt by tomorrow, we have to wait for 4&quot; of snow to fall before plowing, mostly students live here and they can walk to class, etc. The city and county simply don't have enough equipment and personnel, and have not invested in getting the proper equipment or hiring enough crews. It isn't a priority, while the fat cats in city hall still make their fat salaries and the residents of the city and county incur damages to their automobiles and bodies due to this inexcusable winter road maintenance. The road commission and the city need to take responsibility for their inadequacies and make it public. Stop hiding behind excuses and some politically correct insane thinking that using salt is wrong. Other cities with far more snow do a terrific job of road maintenance in the winter. Every other county around Washtenaw seems to do a good job, but when you hit the Washtenaw County line, it's a disaster. I've lived in A2 for 30 years and snow removal and maintenance have only gotten worse each year regardless of how much snow falls. Your tax dollars are not at work here people, and it's time to let them know in city hall and at the county road commission. Vote them ALL out! In the meantime, call them and complain! Sat, Jan 14, 2012 : 2:25 a.m.
Sallyxyz- you need to stop getting polical in a article on bad road conditions. You complain but then change to voting. Mother Nature is to blame for sending us this snow. PThere are lots pf people out there now working their tail ends off cleaning up the snow while you type away. Fri, Jan 13, 2012 : 3:59 p.m. I saw one city plow out on my commute this morning. It was plowing the &quot;mixed use path&quot; that runs along Huron Parkway. Meanwhile, Huron Parkway was an atrocity. Fri, Jan 13, 2012 : 4:27 p.m. The Huron Parkway is always a disaster when it snows. It simply isn't plowed or salted. I guess the city figures that it will melt eventually, so let's just wait! Fri, Jan 13, 2012 : 4:22 p.m.
Fri, Jan 13, 2012 : 4:20 p.m.
Fri, Jan 13, 2012 : 3:50 p.m. I'd like to know how many of the folks involved in accidents were either drving SUVs, were distracted by using a cell phone and eat breakfast behind the wheel. An inch of wind driven snow is more icy then several inches. The thin film of compacted snow forms the thin layer of ice when driven over by traffic. Temperatures around 20 are less effective even on raods that were salted. At best there should have been isolated accidents but too many folks underestimated the hazardous conditions. The heavier bursts of snow occured during the morning rush hour which made the bad situation worse. Fri, Jan 13, 2012 : 6:03 p.m.
Just checked AA.com weather page link and the hourly weather obs at the Municipal Airport and yes, the wind had decreased from 6:30 at 8:30 as @just it plain states but we had temps around 19 with some of the lowest visibilites dur to occasional moderate snow showers. The low temps and occasional low visibilities made driving trecherous during the height of the rush hour. Blame both the Road Commission folks, who knew what the weather forecast would be and the careless drivers who had the accidents and not taking responsibility. FYI: I drove into work around 4 AM into the downtown area and I took it easy. The road was mostly snow covered but not hard packed, yet. Traction was fair to good as long as I had my speed under control. Fri, Jan 13, 2012 : 5:08 p.m. I would like to know how many of those involved in accidents today have been in accidents before and how many. I know people that always have fresh dents in their vehicle! Fri, Jan 13, 2012 : 4:29 p.m. It was totally calm between 6:30 and 8:30 in northeast and northwest Ann Arbor, almost kinda balmy really... seriously folks, the weather wasn't too cold for salt to work, nor was it blowing snow, jeez, no wonder people I know think the weather in AA must be 'different' from the weather down the road from them! I think even the major defenders of government services around here couldn't be in this extreme level of denial if they'd felt the obvious differences between the untreated and the treated roads. You can imagine people driving in snow munching mcmuffins and playing with their radios just the same as any other day for them lol, or you can accept the reality of people's reported experiences...I actually had to tell my passengers to not speak to me so that I could pay full full full attention to the roads they were so treacherous at places, and I am not a snow newbie! Fri, Jan 13, 2012 : 4:21 p.m. It was much more windy between 4 and 9 am today. Your post came after 11 AM, thus your &quot;weather observation&quot; may be correct at the moment but does not represent the condtions that occurred early in the day.... I can verify that by cutting and pasting the weather obs out of both Detroit and Ann Arbor but I appreciate the interest. Winds were in the 15 to 35 mph range during that time, including the peak gusts. Fri, Jan 13, 2012 : 4:04 p.m.
No wind out there. Always blame the driver huh? Fri, Jan 13, 2012 : 3:46 p.m. Even though the salt trucks were out at 4am as the traffic starts to hit the road the salts trucks get caught up in the slow traffic too just because people don't see the on every stretch of road doesn't mean they aren't salting the roads they get caught in traffic just like the everyone else. Also if the temperature is around or below 18 the salt isn't going to work as fast as it would if it was 25. Fri, Jan 13, 2012 : 5:37 p.m.
@justcurious Fact are facts and that is all I have posted here. @say it plain I believe what I have been saying is that those that said the crews were not out, do not know what they are talking about and I stand by that! I also said: &quot;Did they get to ALL the trouble spots in a timely fashion? I do not know.&quot; I suspect you would vote in favor of a tax increase to put more drivers on the road on a temporarily for the winter? There again MDOT pays for the freeway maintenance in the winter. Why would you guys have a problem with someone that actually knows how it works explain it to you? Fri, Jan 13, 2012 : 5:21 p.m. Yes, Just Curious... ooooooh people in here actually have connections to the Big Bad Road Commission. Does it really matter? Fri, Jan 13, 2012 : 5:10 p.m.
you are very right jcj, my other half left at 2:45am and won't see him until 9pm tonight. Fri, Jan 13, 2012 : 5:09 p.m.
Fri, Jan 13, 2012 : 5:06 p.m.
say it plain No but some of us not only drive on the roads but have family members that leave to go plow at 3am when most people are still sleeping and then getting up late and leaving late so they have to hurry to get to work! Fri, Jan 13, 2012 : 5:05 p.m.
Nope don't work for the road commission, but have facts straight. And I know what I am talking about. Unlike other people that post with out knowing the facts. Fri, Jan 13, 2012 : 4:57 p.m.
Fri, Jan 13, 2012 : 4:34 p.m. I know for a fact that the Road Commissions trucks were all out in full force at 4am. Fri, Jan 13, 2012 : 4:03 p.m.
Who says the salt trucks were out at 4 am? Fri, Jan 13, 2012 : 3:55 p.m.
Great comment ranger007, very true. Fri, Jan 13, 2012 : 3:19 p.m.
By the way, people aren't crashing because there isn't enough salt or our government isn't doing a good enough job, people are crashing because they drive like idiots. Take some personal responsibility for your actions. If your driving ability is so terrible that you can't safely drive to work in a half inch of snow then guess what stay home and let the rest of the grown ups go to work. Sat, Jan 14, 2012 : 2:21 a.m.
Fri, Jan 13, 2012 : 8:14 p.m.
AMEN to this! And Just Curious, the police call in for salt because they KNOW that many drivers are idiots and will not drive appropriately for the conditions. You simply CANNOT expect all roads to be in perfect shape when there is inclement winter weather. The roads will be slippery, and we all know that. We all also know that driving more cautiously should mitigate almost all problems, yet people don't do it. I also second the notion that many people crashing are repeat offenders. Some people simply shouldn't be allowed to drive. Fri, Jan 13, 2012 : 5:03 p.m. I would love to see statistics for number of people that were in accidents today that have been involved in previous accidents. I would bet you that the overwhelming majority of them have been in numerous accidents before! Fri, Jan 13, 2012 : 4:17 p.m.
Fri, Jan 13, 2012 : 4:02 p.m. The Road Commission has trained us over the years to always blame the drivers. Many have commented on here that the drivers have been driving cautiously (of course not all). How can you say that the roads were adequately salted if so many police officers and deputies have been calling for salt on crucial areas. I would love to hear the $ tolls for just the accidents that have occurred this morning. Accidents are still happening. Me 4th ! Too bad there isn't a licence plate or antenna flag colored for the skill of the driver. That would save a lot of lives and money. Fri, Jan 13, 2012 : 3:30 p.m.
Good comment SW40, I couldn't have said it better myself. Fri, Jan 13, 2012 : 3:29 p.m.
Fri, Jan 13, 2012 : 3:16 p.m. The city and county need to start admitting that they do not salt adequately and that they do not have enough personnel or trucks. If this amount of snow causes this kind of havoc, then everyone needs to start calling city hall and the county and demand more road treatment and snow removal. The fault is not with a few drivers who are driving too fast. That is a contributing factor, but when most drivers are being cautious and driving slowly, and trying to negotiate icy and slippery roads everywhere, then the problem is with the road crews and the lack of salting. There isn't any excuse for the poor road conditions after an inch of snow with plenty of warning. Sat, Jan 14, 2012 : 2:19 a.m.
Fri, Jan 13, 2012 : 4:55 p.m. Wait, was there a fantastic increase in traffic at 4:30 am then?! Sallyxyz, here the issue with the salt. The road commission can put salt down all day long. In order for it to be effective fast, there has to be NO traffic for a bit. When the cars hit the salt, the salt moves. It may move off the road or stick in the tires and go with the car. Its not because they aren't doing it. Because the road commission was in full force WITH SALT at 4am this morning. @justcurious You just do not get it! The regular crews that do the freeways are considered stateside. The Michigan Department of Transportation (MDOT) contracts with the Road Commission to provide winter maintenance services on the State Trunklines within the boundaries of Washtenaw County, which includes: I-94, US-23, US-12 (Michigan Avenue), M-14, M-52, M-17 (Washtenaw Avenue), M-153 (Ford Road connected to M-14), Ecorse Road, and the Willow Run bypass. The costs for winter maintenance of the State Trunklines is paid for entirely by MDOT and can be as high as $1,000,000 per season, of the $2.8 million total budget. So the county has a crew that has responsibility for those roads for winter maintenance. Those people that do not sit at home and listen to the scanner, but are out driving on roads that are NOT freeways would not be very happy IF the road commission ignored those secondary roads in favor of ONLY the freeways! Fri, Jan 13, 2012 : 5 p.m.
A family member drives for them so I have 1st hand knowledge. So how are you connected to the Road Commission? Fri, Jan 13, 2012 : 3:13 p.m. Drivers of cars and trucks involved in crashes should be ticketed if they have 'Summer Only' tires on their vehicle. Its easy to spot and the danger is real. Read your owner's manual. Why put others at risk? Fri, Jan 13, 2012 : 6:23 p.m. Even &quot;all weather&quot; tires don't work quite as well as snow tires. For quite a few years my husband insisted my all wheel car was just fine with all weather tires. After getting stuck one too many times going up the hill in our driveway I finally got snow tires. I haven't been stuck in the snow since then...course ice is still tricky driving on no matter what tires you have. Fri, Jan 13, 2012 : 3:31 p.m.
Fri, Jan 13, 2012 : 3:01 p.m.
An inch of snow in Michigan causes this much havoc? Only in Washenaw County and the city of A2. Why? THEY DON'T USE ENOUGH SALT!!!!!!!! What are they waiting for? The roads this morning were absolutely terrible. NO excuses, there was plenty of warning. It's some kind of &quot;politically correct&quot; stance that the city and county have adopted re: the use of salt. So, motorists are left to fend for themselves. Start sending your accident claims to the city and county. This is negligence. Fri, Jan 13, 2012 : 3:43 p.m.
MRunner I agree. I just talked to my wife and she was saying we only got 1/2&quot;. I reminded her that it is easier to drive on 2 inches of snow than 1/2&quot; that will turn to ice. Fri, Jan 13, 2012 : 3:38 p.m. Ever try driving in an inch of snow in hills of Cincinnati? They had Winter Weather Advisories in effect for an inch of snow. Check their accident highway map... An inch snow tends to glaze more when compacted and refrozen by traffic then a couple inches or more. Fri, Jan 13, 2012 : 3:18 p.m.
&quot;So, motorists are left to fend for themselves.&quot; They need to start taking responsibility for their own actions! Fri, Jan 13, 2012 : 3:08 p.m.
Officers are still calling for salt trucks to salt bridges. Accidents continue to pile up. Ambulances being called out. Power poles being hit. Pedestrians struck. Total mayhem. Fri, Jan 13, 2012 : 2:44 p.m. Constant accidents continue in the county. Tow Trucks having a field day...police and sheriffs stretched to the limit getting to all of them. Sat, Jan 14, 2012 : 2:13 a.m.
Fri, Jan 13, 2012 : 4:59 p.m.
&quot;police and sheriffs stretched to the limit getting to all of them&quot; All 6 officers? Fri, Jan 13, 2012 : 3:12 p.m.
All because they refuse to use enough salt. Fri, Jan 13, 2012 : 2:43 p.m. I knew this was going to be fun! I have a 4x4 and don't work so whatever! Fri, Jan 13, 2012 : 2:34 p.m.
disclaimer: I don't usually comment, because the comments on here are ridiculous and people tear each other apart. I was on W I-94, N US-23, and Washtenaw this morning, about a half hour ago. 94 and Washtenaw were terrible. It did not appear that the roads had been treated. I absolutely agree with Sara, fellow commuters were fabulous out there today and deserve to be commended for that. Ok, have at it folks. Rip my post to shreds. I really don't care. Fri, Jan 13, 2012 : 3:56 p.m.
Fri, Jan 13, 2012 : 2:45 p.m. Thanks for your experienced assessment. I agree with your post completely. I was on Geddes, Golfside, N 23, Plymouth Road, and did not see any evidence of salt on the roads, nor did I see a single salt truck in my hour+ on the roads. Fellow commuters were great. People were careful but not overly cautious. Would have been a great commute if the roads had been treated before the morning traffic (or even during). Fri, Jan 13, 2012 : 2:41 p.m.
Fri, Jan 13, 2012 : 2:29 p.m.
Its too bad that Ann Arbor area residents never get practice driving in snowy conditions. If they did they would drive better and reduce traffic accidents. Fri, Jan 13, 2012 : 3:02 p.m. Right, this isn't actually snow we drove in this morning lol. Fri, Jan 13, 2012 : 2:23 p.m.
1&quot; and everyone goes nutso. Fri, Jan 13, 2012 : 2:26 p.m. It is not the amount it is the fact that it turns to ice. 4&quot; is sometimes easier to rive in. Fri, Jan 13, 2012 : 2:16 p.m.
People just can't seem to get their heads around the difference between the City of Ann Arbor and Washtenaw County. And these people are allowed to vote! That's scary! okay, @jcj, thanks for clarifying...I can't speak to the condition of Washtenaw County Road Commission road conditions because I wasn't on any of them today. But fwiw some of the people I know who come into Ann Arbor for work live in neighboring counties and they claim that things deteriorate pretty clearly as soon as they enter Washtenaw. I do little traveling in snowy conditions on County-cared-for roads myself, but I have been aware over the years of how during a storm MI highways are poorly cared for compared to other states I've lived in or even compared to say Ohio battling pretty much the same weather at the time. say it plain What I am saying about the County roads is I know for a fact ALL hteir drivers were out at 4am. Did they get to ALL the trouble spots in a timely fashion? I do not know. I was out for an hour or so between Newport and Zeeb, not on the freeway. I saw at least county truck and no city trucks. Does that mean the city was not out? I could not say definitively. But I did not see any between 7:45 and 8:45. Fri, Jan 13, 2012 : 2:28 p.m.
Fri, Jan 13, 2012 : 2:07 p.m.
@justcurious has it just right with the questions about the city, grrrrr..... Without snow so far this winter, it was feeling like maybe this year things would change?! The city hasn't had to spend any money/resources yet to salt, plow... I drove to drop off kids at schools today... People were going slow. People were being cautious. But the roads were terrible. City roads were very very slippery. But UM-maintained roads and some of the roads near school drop-off areas were fine. You know why?! *Those entities salt! * Everyone I saw was driving carefully and slowly and still sliding. It's just appalling, and there are many people I know who work in Ann Arbor but live in other cities who say they 'don't get it' why the roads are worse here. Those who don't pay much attention to local 'news' truly believe we must somehow have different weather here! Well, maybe political/managerial weather! The last couple of years has decidedly been the worst snow/ice road management I've seen in my decades in town...a steady decline since Hieftje's been in office and a more drastic decline recently. Ridiculous. I couldn't even make it up the small hills downtown easily, and Plymouth! Oh my, I almost spun out stopping for a ped crossing! And while I don't have snow tires, I have good winter-y all-seasons which my garage just told me look fine for winter. Well, winter in cities that take care of their roads maybe! My experience on Plymouth this morning led me to realize that our silly city needs to get a program of pedestrian signaling for crosswalks in place, or else there will not only be the rear-end thing that was happening, but *also* spin-out/fender-benders because drivers have to hit their brakes quickly and the roads *aren't being salted*! Fri, Jan 13, 2012 : 8:04 p.m. Yes to all of the above. My drive to work is quite short, but it involves a number of hills. Even going about 3 mph in a FWD car with what I've been told are fine tires, I almost couldn't stop going downhill on a residential street. Others are correct that I have no evidence that trucks were not out somewhere, but they certainly hadn't touched my neighborhood, N. Main or N. State. Do some people drive poorly in this weather? Of course. Is &quot;driving better&quot; the panacea for all accidents? Of course not. Fri, Jan 13, 2012 : 3 p.m.
Oh, yes, @SuperiorMother, about the &quot;how can you tell it's been salted&quot; . You can see it, feel it hit your vehicle, and feel your tires grip the road in a way they had not been griping on untreated roads. Different colors too, really...the snow on the untreated areas I drove on (Plymouth, S. Huron, Miller/Maple) was slick slide-y white and you sensed that if you did get out of your car to walk, it would be slippery under your feet, packing down, turned to iciness. On the UM and school zone roads, on the other hand, things were grayer, slushier, far less icy. You could see that if you got out to walk, it would be far far less slippery, and your tires sudden ability to grip added to that feeling. It was quite obvious, quite striking. Fri, Jan 13, 2012 : 2:30 p.m.
&quot;I drove to drop off kids at schools today... People were going slow. People were being cautious. But the roads were terrible. City roads were very very slippery. But UM-maintained roads and some of the roads near school drop-off areas were fine. You know why?! *Those entities salt! *&quot; Yes, this exactly. I was on the roads in Ypsi, Superior, and Ann Arbor for more than an hour this morning (much longer than usual) and did not see any evidence of salt on any major or secondary road. And to the person who asked how we know that the roads weren't salted - when driving on a road that has been salted, you can see the salt on the road, you can hear the salt hitting your vehicle as you drive, you can see the salt starting to work on the road. I did not see any of that on ANY road I was on this morning. Fri, Jan 13, 2012 : 2:05 p.m.
My fellow commuters were great - I was happily surprised. No one rushed, no one tailed, and everyone braked appropriately. It was a relatively easy commute in, despite the fact that the roads looked mostly untreated. I suspect the really cold weather that came with the snow also made road conditions worse (since, in previous snow fall this season, roads have been fine). Now, to get it cleared up for the evening commute - hop to it, Ann Arbor! Fri, Jan 13, 2012 : 3:54 p.m.
Say it pain, you are correct. It's not REALLY cold; but relatively speaking, when you look at the previous snow and the recent temps. Ultimately, I agree with you. I find the road conditions, in Ann Arbor, to be a travesty, especially since we do live in a place where it snows. And yet, every storm is like a new experience. I was comparing my experiences with a friend in TX and everything is handled about the same. Fri, Jan 13, 2012 : 2:21 p.m.
Fri, Jan 13, 2012 : 2:01 p.m. The Road Commission was out in full force by 4am today people. City and County are 2 different entities. The Road Commission gets dispatched to certain priority roads first. So secondary roads have to wait a bit. But once again the plow trucks can only do some much. They are fighting the weather elements but mainly the public. Its hard for them to do their job when cars are speeding and not paying attention. Giving them the finger and honking therr horn for slowing them down on their day. We need the plow trucks so give them a brake people. Put the breakfast down, put the cell phone down and slow it down. Fri, Jan 13, 2012 : 3:22 p.m.
wow, that is pathetic that people would flip off the plow trucks. very sorry to hear that. Fri, Jan 13, 2012 : 1:51 p.m.
Michigan needs vehicle inspections. Every vehicle on the road needs to be checked for proper operation and correct tires for the season. Snow/Winter tires need to be mandatory during the winter months. If you cannot afford to purchase said tires then you need to stay off the road or move to a different state. SE Michigan gets a minor amount of snow fall yet people still fail to drive proactive and safely. Fri, Jan 13, 2012 : 9:28 p.m. The effectiveness of snow tires has been proven over and over again. If you think they do not help on ice then you are extremely ignorant to modern tire construction. If you feel the cost of said tires is too much of burden for you then you should not be allowed to own a registered vehicle in the state of Michigan. What all this &quot;if you&quot; means is you are the hazard on the road that prepared drivers have to avoid. Please do us responsible drivers a favor and turn in your license and car keys. Fri, Jan 13, 2012 : 5:24 p.m. Some of us choose to drive slowly in bad conditions. Or we don't drive in those conditions. Not everyone needs to spend $1000 on a set of snow tires to make us think we can drive fast on ice..... and still crash. Where did I or any of the post on this thread reference ANY crashes? Where did I indicate that 4wheel drive will help you stop? I have been driving 4x4 's for over 35 years including with plows. &quot;But 'too fast for conditions' means you were overdriving the surface conditions for the tires that you have&quot; This seems to indicate that IF you have the right tires you can stop on any surface. Absolutely false! Except that all these crashes didn't happen because people were starting off from being stopped. They occured because they could not slow down, stop or steer. Your 4 wheel drive is no better that rear wheel drive when it comes down to stopping. That is indisputable. But 'too fast for conditions' means you were overdriving the surface conditions for the tires that you have: worn, summer only, too fast, or too late. Fri, Jan 13, 2012 : 3:24 p.m.
WRONG! &quot;Four wheel /All wheel drive doesn't solve the 'Ann Arbor' problem because stopping is the issue, not accelerating&quot; Stopping should not be the issue that is mainly a driver mistake! ie: driving too fast for conditions or following too close! But trying to get started on a glazed over hill is enhanced with 4wheel drive. Fri, Jan 13, 2012 : 3:05 p.m.
'Snow tires' certainly do help on ice. I have Blizzaks on a front drive car (all 4 wheels) and the stop and go is excellant, especially on glare ice. Four wheel /All wheel drive doesn't solve the 'Ann Arbor' problem because stopping is the issue, not accelerating. With snow/ice tires, the danger is now from behind as that driver with a cell phone in one hand, a MacChicken in the other and late for their hair appointment has no interest or ability to drive safely. Fri, Jan 13, 2012 : 2:06 p.m. Snow tires won't help anyone on icy roads. Fri, Jan 13, 2012 : 1:57 p.m.
Cars with 4wheel drive or front wheel drive are MUCH more efficient at getting around than almost any rear wheel drive with snow tires. Snow tires a good idea but not the total answer. Fri, Jan 13, 2012 : 1:43 p.m.
Before it gets started let me remind you just because YOU don't see a plow truck does NOT mean they are not out in the county! As stated yesterday At 4 a.m.,&quot;a full crew will report to man the county's entire fleet of 46 snowplows.&quot; Having said that the people at city hall that are responsible for city roads do not have a clue! At very LEAST they should have been out salting the hills around town. They will NEVER get their priorities straight until some of them are voted OUT of office! For those of you that keep voting them in, you need to refrain from posting about the mess this morning because you helped create the mess! Fri, Jan 13, 2012 : 2:54 p.m.
jcj you are so right. My husband was out the door at 2:45 to be at work at 4.Thanks for stating positive info on the Road Commission. They need more of it on days like this. Fri, Jan 13, 2012 : 2:03 p.m.
justcurious Misread your comment &quot;They need to concentrate their efforts on the freeways first! That is where the majority of the traffic will be.&quot; Get out of your house and you will find that there is plenty of traffic everywhere. Fri, Jan 13, 2012 : 1:55 p.m.
@justcurious And WHERE do you get your information? I know for a FACT all the county drivers were called in at 4am! And they were not all on the freeway! Of course they would state that..the reality is another matter. They need to concentrate their efforts on the freeways first! That is where the majority of the traffic will be. Accidents continue on the scanner, as well as calls for salt. How much property damage and injury is enough? Fri, Jan 13, 2012 : 1:36 p.m.
Overnight snowfall...hmm yet, none of the roads this were salted this morning. I thought the city had plenty of salt (or money saved from the lack of snow we've had so far) but where is it? Unbelievable. Fri, Jan 13, 2012 : 3:20 p.m.
MGoBlueMamma: you can make your point without calling everyone ridiculous. Your argument &quot;how do you know...&quot; can easily be countered by &quot;how do You know&quot;. No one can be everywhere. &quot;How do you know there was not salt?&quot; I have been driving in Michigan since 1988. When the roads have been salted, you can see the salt. You can hear the salt hitting your vehicle as you drive. You can see spots on the road where the salt collects, and spots where it has started to work. I saw none of this in my hour+ on the road this morning, nor did I see a single salt truck in Ypsi, Superior Twp, or Ann Arbor. LA2A2- you are ridiculous. How do you know there was not salt? Did you get out of you car on State St and see. There was salt but once the salt hits the road it has to have time to do its job. Cars also spread it further off the road so it takes a few passes of the trucks for it to stick. Plus the City is responsible for the side roads in that area not the Road Commission. They have the overpasses and freeways. Fri, Jan 13, 2012 : 1:50 p.m.
@Ross, by saying NONE I was trying to make a point. I drove 6 miles from northeast A2 to State &amp; Eisenhower, and yes, NONE of the streets I took were salted. Fri, Jan 13, 2012 : 1:44 p.m.
@Ross do you know the difference between city streets and COUNTY roads? Look at a map! Fri, Jan 13, 2012 : 1:41 p.m.
City of A2 also had plenty of advance notice of the impending snowfall. I live 15 miles west of town and the roads in that area were at least salted and comparatively clear. Um, none? Did you drive them all? All the major roads I was on in Washtenaw county were salted and in great shape. Fri, Jan 13, 2012 : 1:29 p.m.
As of now I have heard reports of 4 school buses being involved in accidents, Ypsi and Ann Arbor. Accidents continue everywhere, including the freeways. Fri, Jan 13, 2012 : 3:21 p.m. I would love to see further reporting on this if it's true! On an average day, too many school buses speed down a neighborhood road where the speed limit is 15 or 25 (depends on the sub) en route to schools. It is really not that hard. Drive slower, leave a lot of distance between you and the car in front of you, brake sooner and don't slam on the brakes. Fri, Jan 13, 2012 : 5:17 p.m.
Fri, Jan 13, 2012 : 2:27 p.m.
MgoBlueMomma You seem to be the only one that understands how it works! Well and myself of course. Fri, Jan 13, 2012 : 2:13 p.m.
Just curious- your are ridiculous. FYI the Road Commison was out in full force at 4am this morning. They can only do so much when the snow keeps falling. There can not be a truck everywhere. Priority roads are the expressways, bridges and overpasses first. We need the road commission. Fri, Jan 13, 2012 : 1:42 p.m. Agreed, Richard. That last point being key. The reason most people end up in the ditch is because when they start to slide, they lock up the brakes in a panic instead of simply counter-steering to ride out the slide. Also, come on people, invest in snow tires for the winter months. Makes for a much more pleasant and safe winter driving experience. Fri, Jan 13, 2012 : 1:31 p.m.
And have salt trucks out on the road much earlier!! and abolish the Road Commission. Fri, Jan 13, 2012 : 1:05 p.m. Per the scanner, one car slid off Dehli and was partially submerged in the river. Tons of accidents everywhere on all of the freeways around Ann Arbor, multiple accidents on N. Territorial, Michigan Ave., Washtenaw, Glacier Way, Green, Saline-Ann Arbor, school bus vs. car in Ypsi, etc., etc. Officers calling for salt trucks per usual. Dispatchers saying &quot;no answer&quot;. What is wrong with this picture? Sat, Jan 14, 2012 : 2:10 a.m.
justcurious The Road Commission has a State Trunkline Crew just for the freeways that are out on them the entire time, the truck you saw was from the county side of the Road Commission not the State Side.. Sat, Jan 14, 2012 : 12:38 a.m. I think you mean North Delhi, not East or West Delhi. North Delhi has a hill just before it ends at Huron River Drive. Earlier in the winter, I passed a SUV near Delhi Metropark that had its rear wheels stuck in a ditch. With its winding curves, Huron River Drive can be a risky area for fast drivers to travel on; in many places the Huron River itself isn't comfortably far from Huron River Drive. Fri, Jan 13, 2012 : 2:35 p.m.
MgoBlueMama, I disagree. At 7am a plow went down Island Lake heading east. He should have been out on the freeways. You cannot always blame the drivers. If the roads are unsalted, accidents happen. The Road Commission need to concentrate on the freeways and they never do. Fri, Jan 13, 2012 : 2:10 p.m. The plow trucks are the salt trucks too. They can mutli task. The side roads are not going to gets first priority just because of a spin out. The expressways are first. That has the most traffic. If people would slow it down some and pay attention to their driving then we would be having as many accidents. The Road Commission is not responsible for the accidents. The drivers are! They do their job, the drivers ahve to do their part as well. True, drivers need to slow down, HOWEVER, the city also needs to do its part by SALTING! Fri, Jan 13, 2012 : 1:35 p.m. Saw a County truck plowing the Shoulder of 94. Not a Salt Truck in sight. Uhmmm. . . people driving too fast, not giving themselves enough time, talking on cell phones, texting, etc. It's an inch of snow for cripes sake and it's not like we weren't given sufficient notice.